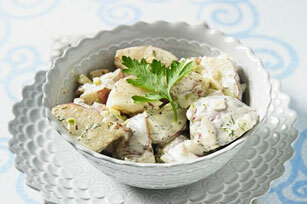 Cubed red potatoes and fresh dill give this potato salad lovely colour. It gets its creaminess from MIRACLE WHIP, sour cream and Dijon mustard. Cook potatoes in boiling water in saucepan 15 min. or until tender; drain. Cool. Place potatoes in large bowl. Add celery and onions; mix lightly. Mix remaining ingredients until blended. Add to potato mixture; mix lightly. Add 1/2 cup Oscar Mayer Real Bacon Bits just before serving.